Summary: A crafty ronin comes to a town divided by two criminal gangs and decides to play them against each other to free the town. Yojimbo, directed by Akira Kurosawa, is a timeless masterpiece. 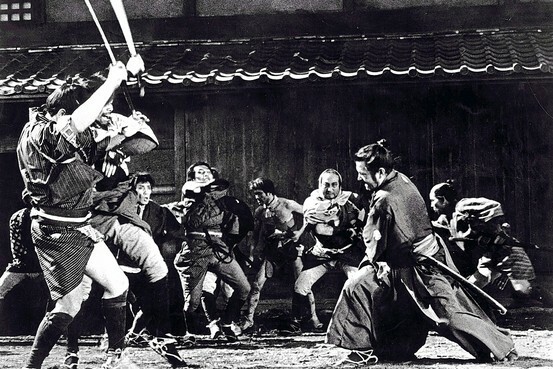 Elegant and enigmatic, Yojimbo is one of the best and most influential action movies of all time, and a delectable feast to the lovers of the genre. It is the most sought-after of the Akira Kurosawa's movies, shamelessly imitated on multiple occasions – the most infamous being 'A Fistful of Dollars' by Sergio Leone. Yojimbo is a delightful addition to an unending list of avant-garde movies made by the Oriental master. It is as superior to any of the movies that it has inspired as a master is to his artless apprentice. The global impact of the Yojimbo was such that Kurosawa was forced by his producers to make a sequel of the movie—the only sequel that he made during his long illustrious career—the very next year by the name of Sanjuro (1962), also starring Toshiro Mifune. 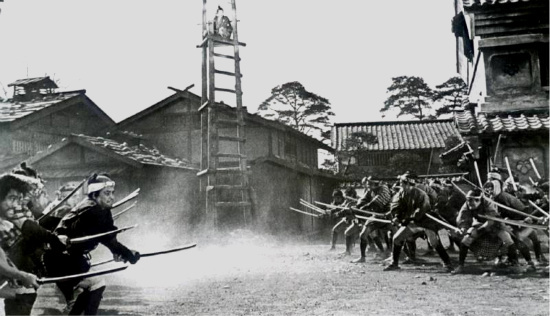 Before watching Yojimbo, I had already savored a handful of Kurosawa movies including Seven Samurai, Ran, Dersu Uzala, Rashomon, and High and Low. Each movie left me mesmerized, but in a completely different manner than the last. In my past reviews I have repeatedly committed an invidious blunder of failing to acknowledge the ginormous contribution that Toshiro Mifune made in Kurosawa's colossal success. I would be remiss again if I fail to testify the fact that Yojimbo is more synonymous with Mifune than it is with Kurosawa, and anyone who has had the privilege of watching Yojimbo wouldn't want me to budge even by a slightest degree. The role of 'Sanjuro', though demanding, can be any performer's dream, but a slight lack of proficiency or commitment on his part can serve as a volte-face, transforming it into his biggest nightmare. I don't think that anyone but Kurosawa was competent enough to judge Toshiro Mifune's talent as a performer, and so I would like to quote an excerpt from his biography: "Mifune had a kind of talent I had never encountered before in the Japanese film world. It was, above all, the speed with which he expressed himself that was astounding. The ordinary Japanese actor might need ten feet of film to get across an impression; Mifune needed only three. He put forth everything directly and boldly with a great sense of timing. And yet with all his quickness, he also had surprisingly fine sensibilities." In Yojimbo, Toshiro Mifune incredibly outdoes himself with a portrayal that can be excruciatingly hard to be described in words. Mifune is crafty, cunning, capricious, and yet seemingly nonchalant as the ingeniously disingenuous ronin, a portrayal overwhelmed with so many contrasting attributes that it revolutionized the very concept of an anti-hero in the world of cinema. Sanjuro is a cross between a wolf and a sheep, a guardian and a usurper, a misanthrope and an altruist, a demon and an angel, a libertine and an ascetic, a fiend and a beloved, a mercenary and a messiah and that's what makes this portrayal singular and incredibly magnificent. Mifune has meticulously taken care of even the slightest gestures and the subtle changes in mannerisms during the portrayal: be it Sanjuro's perpetually grinned countenance or his nonchalant disposition. The trivialities and nuances evince certain details that are hard to express in words, and can only be savored through watching. Despite Sanjuro's rapidly changing expressions and his frenzied demeanor, Mifune always seems to be in absolute control of himself. 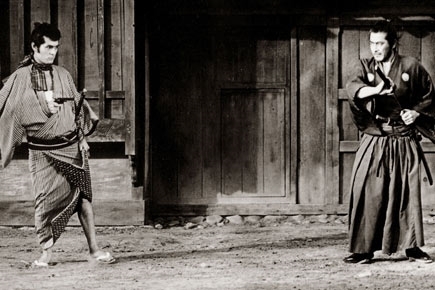 Yojimbo is a well etched, taut narrative with a dark comical look that makes it one of a kind. Yojimbo neither appears to be superficial nor superfluous, and not a moment of it is extraneous. 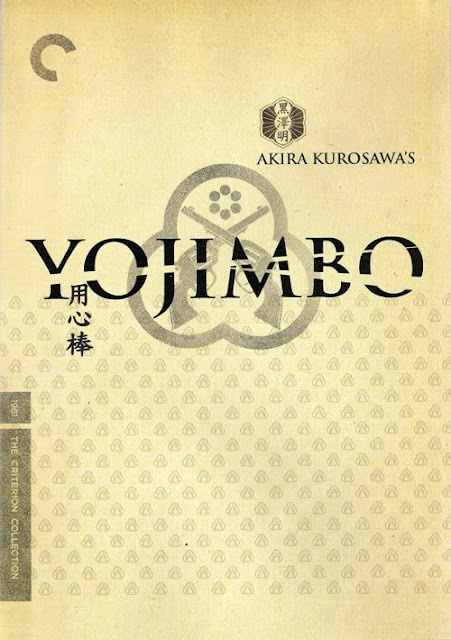 Human values and emotions are ubiquitously similar irrespective of the cultural and the social divide between the peoples of the world, and hence everyone can savor the thought-provoking movies of Kurosawa; even those who are daunted by the handicap of using subtitles can relish a movie like Yojimbo as a silent movie because of it being so visually descriptive like the Charlie Chaplin movies. The plot of the movie is simple and may even appear to be commonplace owing to the countless imitations that it has inspired, but it is the rapport between Kurosawa and Mifune (undoubtedly the best director-actor pair of all time) that makes it so especial and unique. A penniless ronin (samurai without a master) enters a town rotten with schism (Akira Kurosawa challenged his assistant directors to come up with an image for the film to let Sanjuro know he was entering a bad town. Eventually, Kurosawa himself came up with the idea of the dog carrying the human hand). The two gangs are sporadically involved in sanguinary duels resulting in mass slaughter. The ronin demonstrates his skills by slaying two members of one of the gangs. After asseverating his supremacy, he joins the other group for a substantial sum, but backs out just when a decisive battle was about to begin. He then climbs the nearby bell tower as a point of vantage for himself, and watches with rapturous glee the bravado of the pusillanimous gang members disappearing in thin air as they are overcome by trepidation. They lunge and retreat on multiple occasions without making an actual contact before getting interrupted by the news of an inspector coming for an official inspection. The duel is postponed indefinitely to everyone's delight. In the meantime, Sanjuro lets them know that his services are open to bidding, inducing a tussle to acquire his services while he continues to act as an instigator further intensifying the rabid rivalry between the two groups. But soon the tables are turned, and this child's play transforms into a moment of reckoning for the ronin as he finds himself haplessly pitted against the surviving gang. He is captured and brutally assaulted, but he manages to escape from some local help. 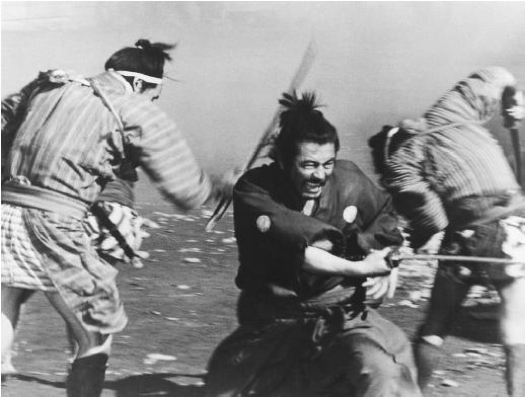 Yojimbo culminates in one of the best climatic endings of all time as Sanjuro single-handedly obliterates the whole gang, emancipating the town from anarchy and barbarism. 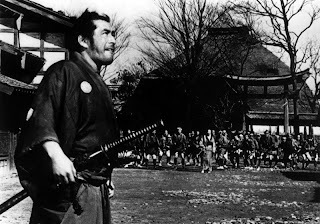 Yojimbo is a must watch for film students, action movie lovers, and especially those who want to acquaint themselves with the eccentrically brilliant works of the oriental master without exposing themselves to his more recondite works like Shichinin no samurai, Rashomon, Ikiru, Akahige, Ran and countless others. 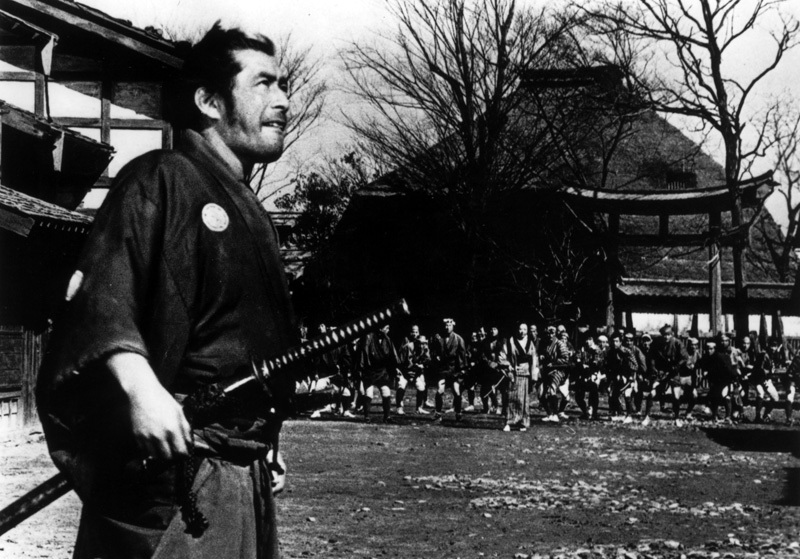 Vintage Kurosawa, Yojimbo is an absolute gem and a timeless masterpiece. 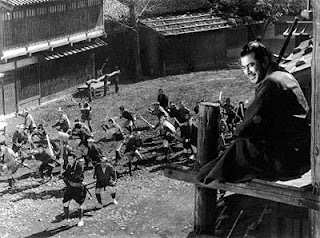 It's indeed a matter of great pleasure for me; I myself am an ardent Mifune fan!!! Great review! Yojimbo really is an excellent movie.